At the end of last year, Swans Academy U18 captain Sam Thorne had an idea that wouldn’t have occurred to many 17 year-olds. As he was finishing his Year 11 studies and looking ahead to Year 12 and the HSC, he asked his teachers if they would give him lessons during the summer school holidays. In December and January, while most students were enjoying the sunshine, Sam spent several days at school with his teachers. “I knew it was going to be hectic to manage playing football with the Academy, and doing Year 12 this year, so I wanted to get a jump on the work before school went back at the end of January,’’ said Thorne. His weekly schedule is even more demanding than many other boys in the Academy’s U18 squad because he lives in Wollongong, nearly 90 minutes drive south of Sydney. At least once, and often twice a week, Thorne leaves school at Edmund Rice College and makes the 90 minute trip from the Illawarra region to Academy training in Sydney. “It’s a juggle travelling to Sydney to train and play games and I knew it would get harder as the season and the HSC went on. I like to plan ahead so I asked the school if my teachers could give me assignments and work ahead of time, and they were great about it. “I usually drive myself on Tuesdays, and dad drives me on Thursdays so I can get some school work done in the car,’’ Thorne said. Thorne’s dedication and professionalism were rewarded this week when he was named captain of the Swans Academy’s U18 team, the first time the Academy has named a leader for the season. Sydney Swans co-captain Dane Rampe was at Academy training on Tuesday to congratulate Thorne when the announcement was made to the U18 squad. “It’s pretty special,’’ said Thorne, a midfielder/forward who is one of the Academy’s top 2019 draft prospects. 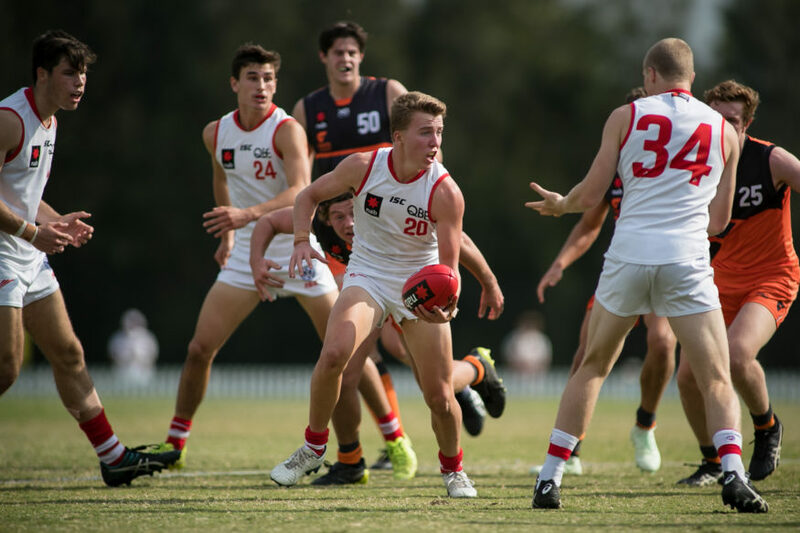 Thorne has a busy few months ahead as he leads the Academy U18 team in a new-look national under age competition, the NAB League, which will see the Swans take on the top Victorian teams for the first time. The season starts for the Swans Academy this Saturday March 30, at 9.30am, when they take on the Tasmanian Devils at Blacktown International Sportspark. The match will be live streamed on the NAB League app. Academy general manager, Chris Smith, has known Thorne since he joined the Academy as an 11-year-old in 2012. “It’s the first time we’ve appointed a captain for the entire representative series and Sam deserves it because he’s an inspirational leader. Ever since I’ve known him he’s had this focus and maturity and he’s gone from strength to strength,’’ Smith said. “Sam embodies everything we admire in our young Academy players. He’s had to travel to Sydney from Wollongong for the past seven years and he’s never missed a session. On the field, Smith says Thorne is a courageous competitor who leads with both actions and words. “He thinks a lot about others and is not afraid to challenge his team-mates to get better,’’ Smith said. Thorne has learned a lot about leadership during his time in the Academy and paid tribute to Swans 2005 premiership player and current Academy head coach, Jared Crouch. “The Academy has taught me that my game gets better when I think about the team first. It takes the pressure off,’’ Thorne said. Thorne said the Academy’s U18 squad is excited by the prospect of taking on Tasmania this Saturday, before they play the GWS Giants, Sandringham Dragons, Murray Bushrangers and Geelong Falcons. “Playing in the new League is such a great opportunity for us to travel together, take on the best clubs and be seen by the recruiters,’’ Thorne said.